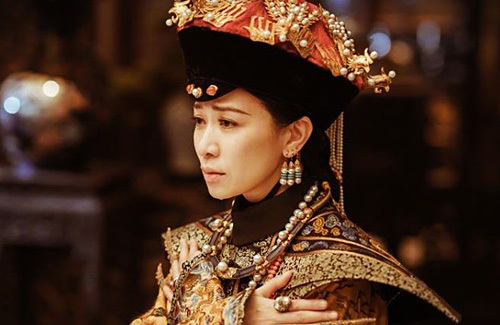 Charmaine Sheh (佘詩曼) will be seen in the upcoming Mainland Chinese drama, Story of Yanxi Palace <延禧攻略>. Charmaine has not filmed an ancient drama in seven years. Story of Yanxi is also her first Qing Dynasty drama after 2004’s War and Beauty <金枝慾孽>. When the trailer first came out, many keen-eyed fans also noticed that the actress did in fact physically resemble Consort Shushen in real life, both possessing high cheekbones, a slim face, and petite mouth. With beauty costumes, eye catching scenery, and Charmaine’s first Qing dynasty role in over a decade, Yu Zheng is confident that Story of Yanxi Palace will bring viewers for a thrilling ride. Starring Qin Lan (秦岚), Nie Yuan (聂远) and Wu Jin Yan (吴谨言), the 70-episode drama will be airing on July 19. @msxie0714 Not easy to look good without attractive hairdo. A face with excellent bones and features will help. The caucasians will fare better. Holy cow….. suddenly so many dramas about Qianlong. No wonder Yu Zheng was bad mouthing other Qing dynasty costumes. To up his own production against others. I love the colors, the intricate settings & detailed accessories. Charmaine is a nice addition. Not in love with Yu Zheng. They need to retire this guy; he’s as bad if not worse than Wong Jing of HK. Arguably he’s worse than WJ because at least Wong Jing doesn’t copy others (he copies the old stuff he made before.) I dread the production whenever his name is associated. I think a lot of Mainlanders feel the same and have mentally prepared themselves for a plot dump. Yu Zheng is a rubbish producer and his costumes will make eyes hurt. But his series earn high ratings and is popular. However Charmaine can do cunning and I would love TVB to do an palace series where she is the villain 100%. Because for me Charmaine can play a smart manipulative woman and she can do villains well, better than goody 2 shoes. @funnlim Agree. I like Charmaine so far in the trailer. Love her expression. Lol, already people is saying this drama plagiarised Ruyi (the one with Wallace Hou). How he will never ever change!